Quick and easy exercises for busy mums! Do you ever fist pump the air when the kids actually take a nap when they are supposed to? Finally, we can exercise without the kids climbing all over us! Some days the thought of exercising is unbearable and on other days we are raring to go, even if it is just for 15 minutes. Whether you’re a working mum or a stay-at-home mum, take a look at our quick and easy exercises that you can squeeze into your morning or evening routine. As seen on Petit Journey, you can fit tricep dips in during ad breaks to help tone your arms and gain muscle strength. Start by pulling up a chair or head to your settee. With your back to the piece of furniture, plant your feet on the ground about shoulder width apart and rest the palm of your hands on the chair. Then, spread your feet out so that your legs are almost straight. Begin dipping your hips towards the ground, creating a bend in your arms. Push yourself back up slowly using your tricep muscles. Continue for a set of 10 tricep dips. You could even practice this exercise in your local park! Toe Taps are perfect for new mums looking to engage and strengthen their core after giving birth. 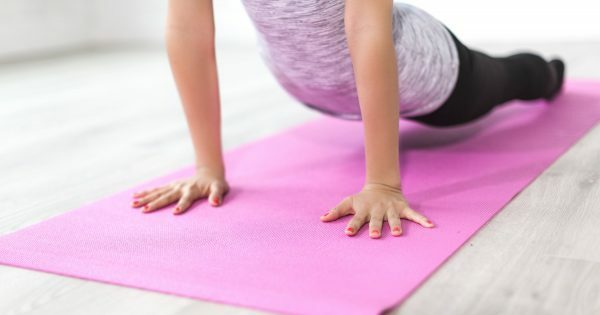 After having a baby you need to take it slow, especially when it comes down to core recovery and you may find an exercise mat useful for this low impact exercise. As instructed on Livestrong, start by lying on your back with your arms alongside your hips. Then raise your legs and bend your knees so they are over your hips and your shins are parallel to the floor. Engage your core to pull your navel to your spine. Slowly lower your right foot and leg to “tap” the floor. Keep the 90-degree bend in the knee as you lower. Return your right leg to the start and repeat with the left leg. Alternate for 30 to 60 seconds. No mats needed for this one! If you don’t have dumbbells to hand, grab a bag of groceries or a full bottle of water and hold onto it. Then, drop your arm down to your side. Make sure your palm is facing forward holding the item. Use your bicep muscles to pull the object upward toward your shoulder. Slowly bring your hand and the object back down. Complete a set of 5 or 10 on each side. The plank is another great exercise for strengthening your core and with so many plank variations you can switch it up to target other muscles too. To nail the straight-arm plank, get on all fours with your hands directly under your shoulders. Then come onto your toes, contract your core and straighten your legs. Keep your body in line from your head to your heels and hold this position for 3 seconds. For more ways to execute a plank, please click here. What’s your favourite exercise? Let us know over on Facebook and Twitter @UKMumsTV.